As the cold and snow settle into the northern states we find more and more people arriving in Florida and trying to stay warm. Whether you’re planning a vacation for a week or you’re coming for the cold winter months, take a look at the Sanibel Island lodging we have to offer. Our condominiums are fully furnished and equipped right down to the convenience of a washer and dryer in your unit. That’s just something you won’t have when you opt for a hotel as your Sanibel Island lodging. And you won’t have a kitchen either. The kitchens are equipped with full size appliances like you’d have at home. We provide everything you’d need to prepare your meals while having the option of dining in. With the holidays approaching you won’t want to miss the Captiva Holiday Village weekends taking place near by. Enjoy an amazing line-up of street dancers and fireworks, Jam concerts, a lighted boat parade, a decorated golf cart parade, and the Captiva Mullet March. On Friday, November 30 Captiva Mullet March will begin at 4:30 p.m. followed by Fire Dancing at Andy Rosse Lane Beach at 6:30 p.m.
On Saturday, Dec. 1 the Junkanoo Parade will be held along with the Mullet Festival that includes fishing, cooking demos, book signing, music fun for all ages at Jensen’s Marina from 10:00 a.m. to 6:00 p.m. Don’t miss it! 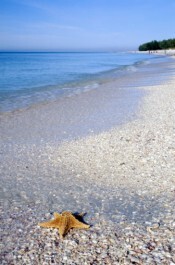 You’ll find the fabulous Sanibel Island lodging we offer to be both spacious and well-priced. Enjoy a relaxing stay in our two and three bedroom condominiums with 1,300 and 1,586 square feet respectively. Our two level townhouses puts your sleeping arrangements on the second floor in these spacious rentals. With nearly 1,500 square feet of living area it’s ideal for groups of up to six people. The amenities we offer will provide you with all the luxuries the area presents to afford you one of the most relaxing and fun vacations ever. Enjoy our swimming pool with lounge chairs around the sun deck. Play some tennis on our courts or go shelling at Bowman’s Beach. There’s plenty of opportunities for biking around the island and wildlife viewing, too. Fishing, nature walks, and shelling are all close by and don’t miss the kayak tours. 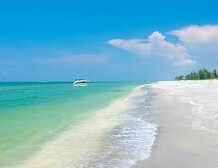 But for some real excitement take a ride on the Sanibel Thriller where you run with the dolphins and get a narrative about Captiva/Sanibel as you tour the islands by boat. At the end of your busy day, return to your peaceful and accommodating Sanibel Island lodging to relax and have a leisurely dinner. We provide a grilling area for your convenience or cook your catch-of-the-day in your own well-equipped kitchen provided in all of our condominiums and townhouses.